Department of Defence and Strategic Studies, Quaid-I-Azam University Islamabad is considered among the few pioneer departments of this prestigious seat of learning. Other than academic activities, this department regularly organizes visits for its students to different strategic and security institutes which includes NHQ,JSHQ, SP D, and of many more organizations. Aim of organizing such types of visits is to develop interaction and also for the capacity building of its students. Recently,On Thursday 5th of July 2018, Department of Defence and strategic studies has organized a visit of its Ph.D, M.Phil ,and MSc students to the National Police Academy Islamabad.The main purpose of this visit was to know the working environment of Police Department. Delegation of this visit includes Chairman DSS Department Dr. Nasrullah Mirza along with 22 students. Delegation of this department reached NPA sharp at 10:00 hrs as per schedule where they were receive d and warmly welcomed by Honorable SSP ILiyas who is an Initial Course Commander at National Police Academy Islamabad.Moreover, After a Formal welcome, Delegates of DSS Department were given a presentation by Director Inter Services Training Dr. Suleman Sultan. His presentation covered almost each and every aspect of Police Department and about the working environment of the Academy as well. Students appreciated the presentation. Right after the Presentation DIG Amjad Khan also joined the delegates for Q/A Session.Students asked quality questions to DIG Amjad khan and Director Suleman Sultan. 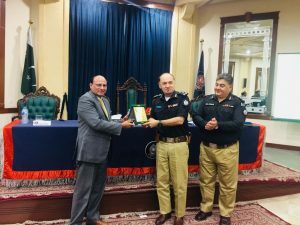 After the Completion of presentation, DIG Amjad Khan Addressed the students and appreciated the iniative of such visit taken by DSS Department of QAU Islamabad. 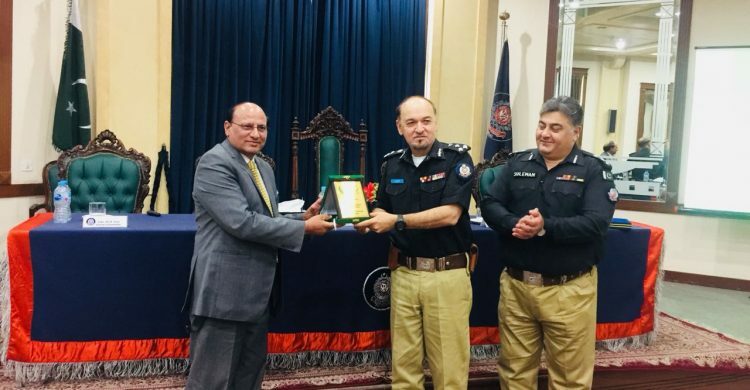 During his speech he also showed interest to further enhance ties with this department and should collaborate to start some sort of Diploma programme for their officers with the DSS Department. Honorable Chairman Of DSS Department also appreciated this idea and said to proceed it further. Dr. Nasrullah Mirza also addressed the audience and thanked the whole NPA Administartion for showing their kind gesture and appreciated our initiative. Exchange of Souvenirs also took place after the complete ceremony which was ended up at refreshment arranged by NPA for the delegates of DSS Department. Delegates also took a round of academic blocks of the academy after the refreshment which was ended up by a Group photo. Before the departure, Delegates thanked each and every officer who were behind this visit preparation.DIGAmjad Khan and Dr. Suleman Sultan alongwith SSP ILiyas at the end departed the delegates at 1Pm.